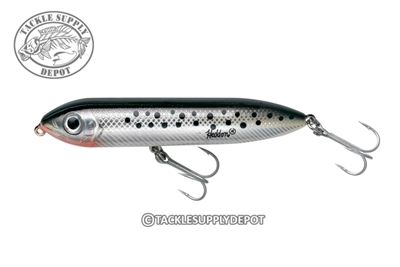 Heddon Saltwater Super Spook Jr. The Super Spook is the backbone of the legendary Zara Spook family of topwater lures, and this downsized version features a saltwater flavor. This tough 3 1/2-inch Super Spook Jr. comes with two of super-sharp saltwater grade hooks and hardware. This is the bait to take on giant redfish, gator trout and massive stripers. Also stands up to the toothy torture of muskies. Heddon Moss Boss Heddon One Knocker Spook Heddon Saltwater Super Spook Heddon Chug 'N Spook Jr.